Audley Freed Knows Strat Tone! Audley Freed is perhaps best known for working with The Black Crowes. But before then, Audley had a 90's band called Cry of Love, whose 1993 release "Brother " includes the tune "Highway Jones". This tune is a fine example of Strat tone and righteous Strat approach. A sample of the tune is available at the above link to the Amazon page. 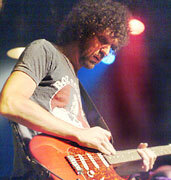 More recently, Audley has worked with Joe Perry, and occasionally joins Gov't Mule. www.cryoflove.co.uk is a working fan site with good info. on Audley Freed. Click HERE for an old Cry of Love video- Too Cold in the Winter - at Youtube. Reminds me a young Paul Rogers with Free.